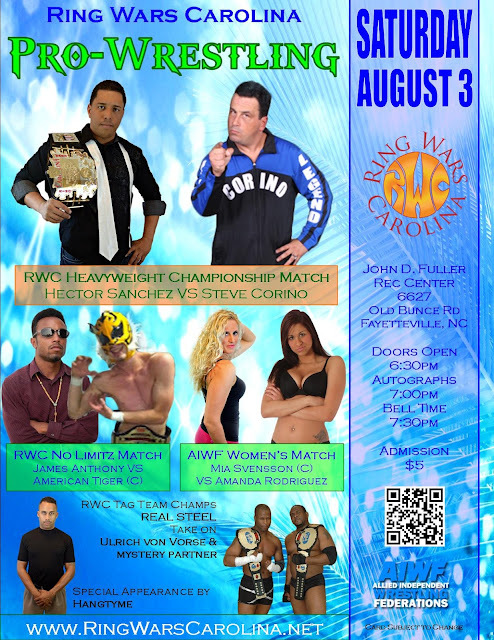 Saturday, August 3rd Ring Wars Carolina makes their return to the John D. Fuller Recreation/Athletic Complex in Fayetteville, NC. Lots of upcoming action that night! Newly-crowned RWC Heavyweight Champion Hector Sanchez will defend his title against the King of Old School, STEVE CORINO. The "Caramel Candy" James Anthony demands a rematch against the RWC NoLimitz Champion, American Tiger. Once again, AIWF Women's Champion Mia Svensson will defend her title against Amanda Rodriguez. RWC Tag Team Champions Real Steel will defend the titles against Ulrich von Vorse, and a mystery partner of his choosing. RWC's very own Hangtyme will also be in action, with your other favorite RWC Warriors. Doors open at 6:30pm, photos and autographs available at 7:00pm with the first bell of the evening promptly at 7:30pm. Come on out to the John D. Fuller RAC in Fayetteville, NC. With upcoming announcements regarding RWC's tour schedule for September, this is one night you WON'T want to miss! Want to learn more about professional wrestling? 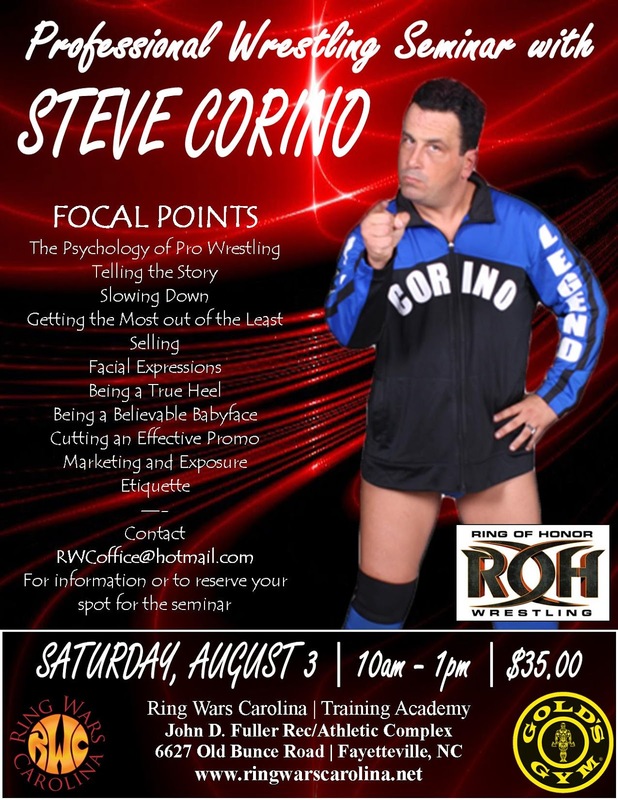 Ring Wars Carolina is pleased to announce that the fifth in an ongoing series of pro wrestling seminars will be held Saturday August 3rd, hosted by former ECW World champion STEVE CORINO. Corino, a 19-year veteran of the squared circle, has traveled the world over and faced off against some of the biggest names the sport has to offer. Now, in this intimate classroom setting, the "King of Old School" will pass on his knowledge to you. The cost of the seminar is $35 per participant and is open to anyone who would like to learn more about the art and business of professional wrestling. Contact us at RWCoffice@hotmail.com for information on reserving your spot at the seminar today! Both the seminar and the show will be held at John D. Fuller Recreation/Athletic Center located @ 6627 Old Bunce Road in Fayetteville NC, on Saturday August 3rd. The seminar starts at 10am. Doors open for the evening show at 6:30pm. Bell time for the show is 7:30pm.